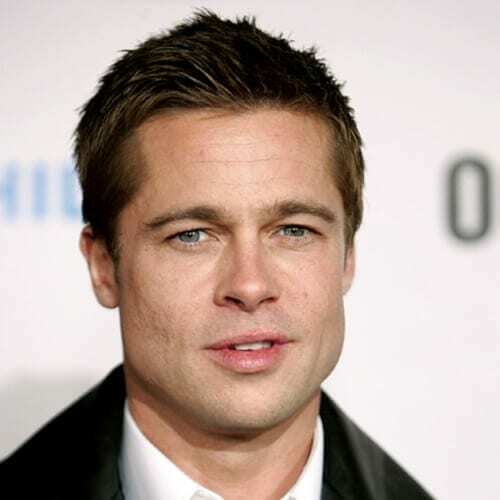 Brad Pitt is internationally recognized as one of the most prominent actors of his generation. In addition to his indisputable talent on screen, he is also admired by women and men alike for his good looks. 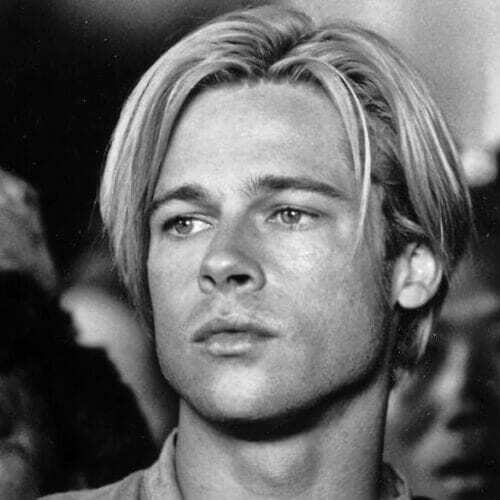 The two-time winner of the “Sexiest Man Alive” title is known for having all sorts of haircuts, so we chose to look at some of the most iconic Brad Pitt hairstyles throughout the years to inspire you for yours. 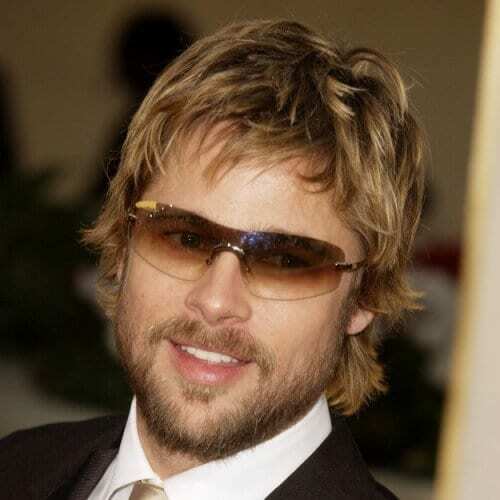 A shaggy, not too long yet not too short haircut is ideal for men with naturally straight hair. The length of your bangs should be right up to your nose, while the rest should be trimmed down to your ears. Your hair may get in your eyes, but at least you’ll look cool while it happens. 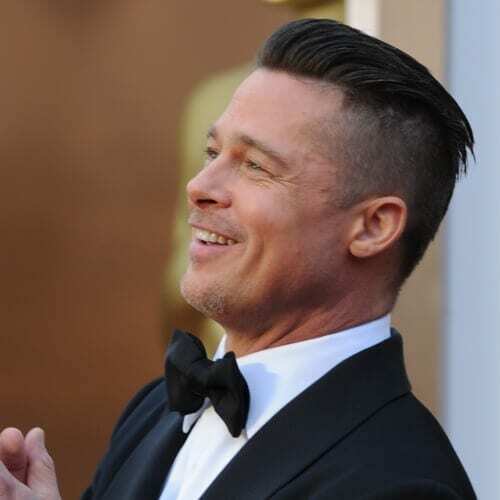 For a more dapper look, let’s study a few of Brad’s hairstyles in recent years. 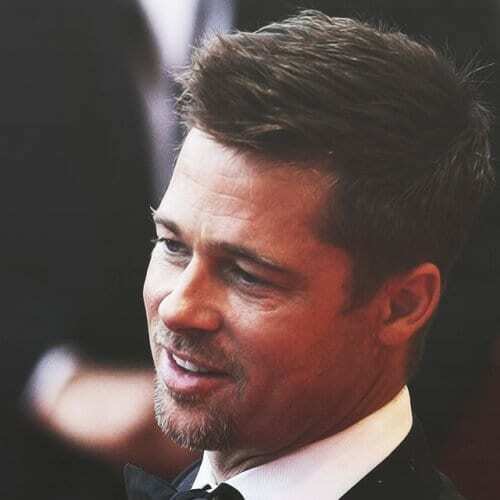 One of his favorite red carpet looks is definitely this clean-cut hairstyle. His locks are just about an inch long on top and are softly brushed upwards and to the side. If you want a shorter haircut that you can wear in any setting, you can opt for a more casual approach. Put a drop of hair product on the tips of your fingers and start raking through your hair in the direction you desire. The semi-spiky results are suitable for all occasions. 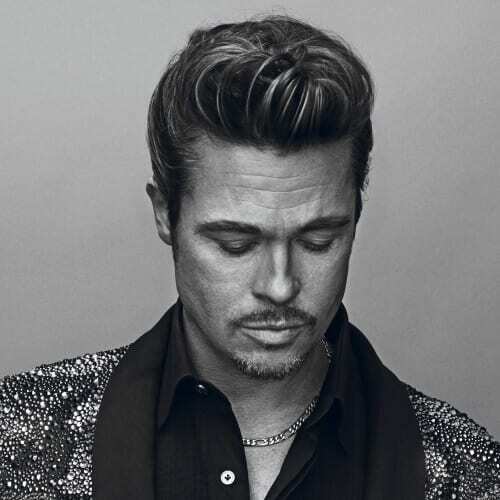 There’s no doubting that Pitt is a stylish man, both off-set and when he’s in character. If your hair is slightly longer, you can try this pompadour hairstyle he rocked in this shooting. Carefully comb your hair towards the center, using the right amount of product. 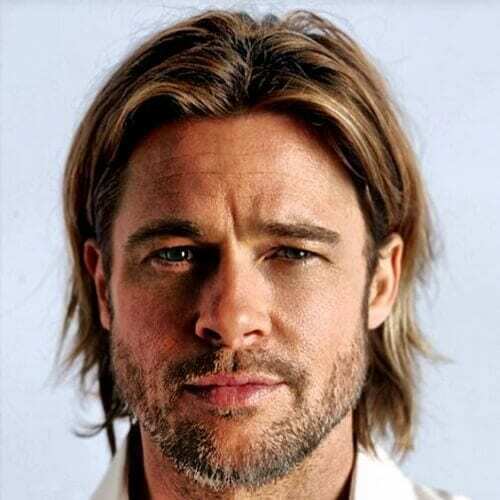 Having longer hair doesn’t mean that you can’t boast the natural elegance that Brad always seems to have. You can grow your hair out to about medium length and then neatly style it. Pull your strands behind your ears and comb it nicely into place. On the other hand, you can always go full-out long with your hair. If you were born with thick locks that also have an agreeable texture, you can allow your hair to grow up until your shoulders. Of course, you can always let it grow even longer, but be aware that it will be harder to maintain. 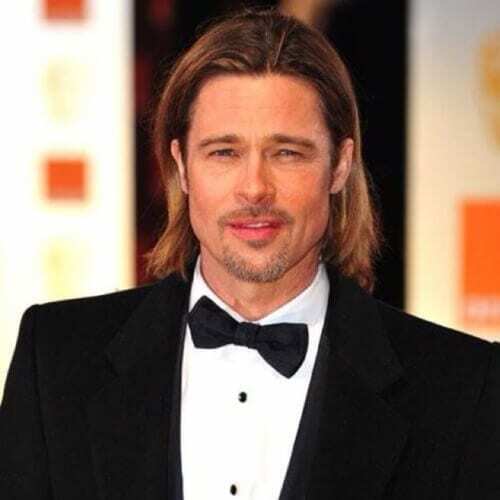 In many of his notable roles, Brad plays a manly, imposing and generally attractive character, with a look that will certainly steal hearts. You can get inspired by the slicked back hairstyle in this shot for an eye-catching appearance (especially for the ladies). 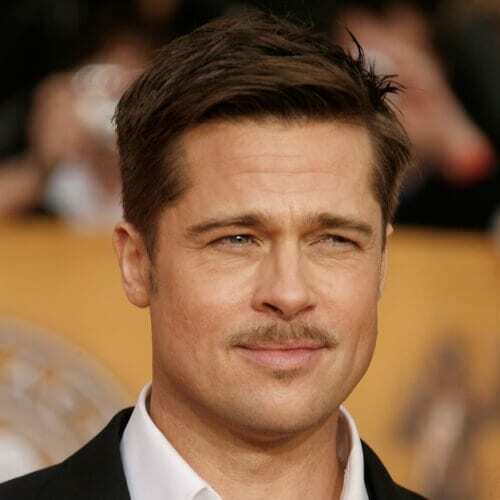 Throughout the years, Pitt has never been a stranger to facial hair. The prestigious actor has always played around with mustaches, beards, and goatees, pairing them with a flattering hairstyle. 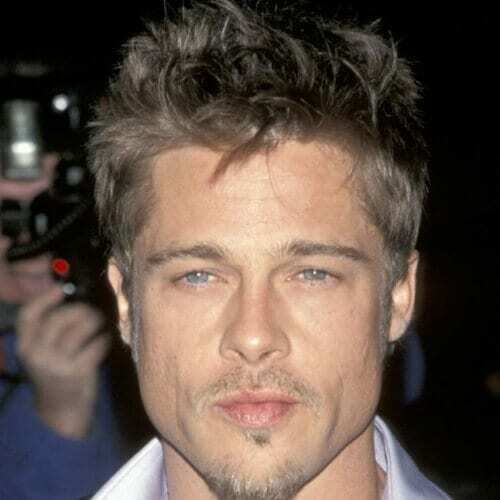 For his mid-length hairstyle, he opted for a finely-trimmed goatee. 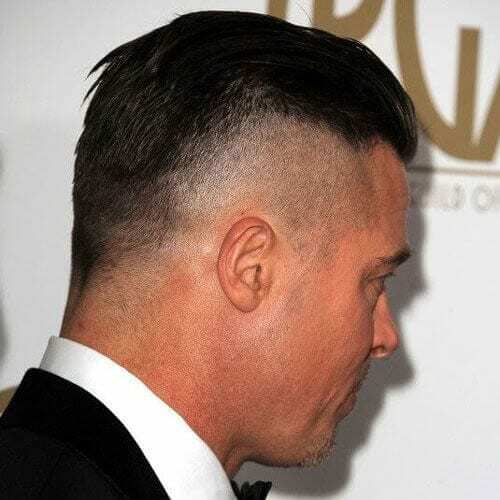 To boost the bad boy impact of your look, always think about an undercut. Even though growing your hair out afterward will prove to be tricky, your look will truly be impressive when sporting an undercut. We recommend leaving a longer top for this haircut. 10. Layered Hairstyle with Highlights and Beard and… what was he thinking!? Okay, okay, this is clearly for a role. While the specific hairstyle in this picture may now be a bit outdated, it serves as an excellent example of how layers can affect your look. If you’re aiming for a dynamic and textured hairstyle, consider adding short and choppy layers throughout your hair. 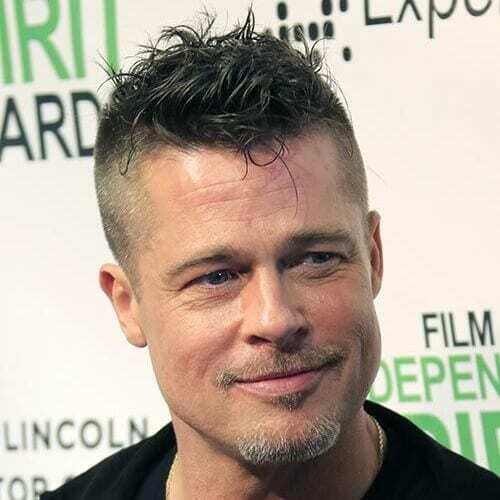 In the past few years, the quiff has been towering over all other hair trends for men. It’s a comfortable, tasteful and relatively low-maintenance hairstyle that tailors to all situations. Whether you’re preparing for an important event or just getting ready for the office, you can count on the quiff. One of the main ingredients for an alluring hairstyle is the silhouette. In other words, you have to pay attention to the overall shape you give your hair to make the look work. Whenever in doubt, opt for a hairstyle that features short sides and a longer top. Even though this hairstyle comes pretty close to the pompadour, it has an accentuated curl in the front. We believe it’s a wonderful look if you resonate with the style of the 50s and 60s, but also if you want to stay on top of trends that have made a huge comeback this year. A man will instantly become irresistible if it seems like his style is natural and effortless. To increase the confidence factor in your look, never shy away from a messy hairstyle. You will be surprised to see how stately the outcome can be. A proper comb over hairstyle will almost always be perceived as a sign of refinement. 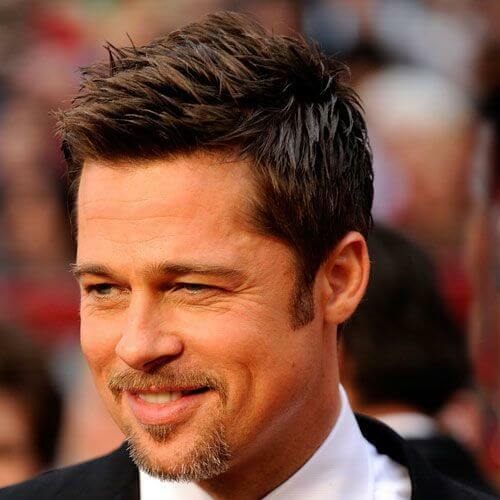 You can express your fine tastes in grooming by parting your hair to the side. Comb each side in place and make sure you add some product to maintain the hairstyle throughout the day. Alternatively, show off your daring side with a mohawk hairstyle. Even though you most likely won’t opt for a classic punk mohawk, you may be inspired to shave down your sides and leave your hair longer on the top and in the back area. 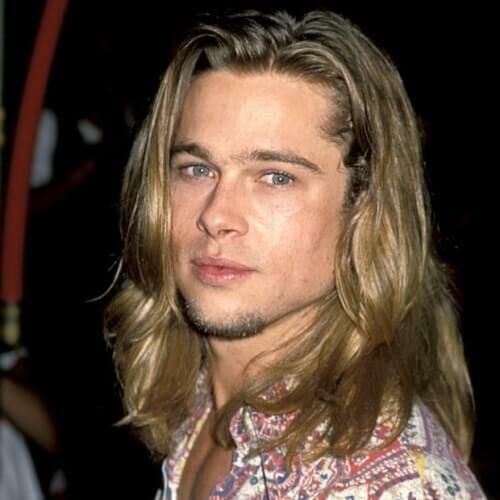 Back in the late 90s, Brad could often be found rocking hairstyles with bangs. Although he never opted for a full bowl cut, his options usually followed the main shape but with wispy bangs. To adapt your look to today’s trends, part your hair and sweep your bangs to the side. 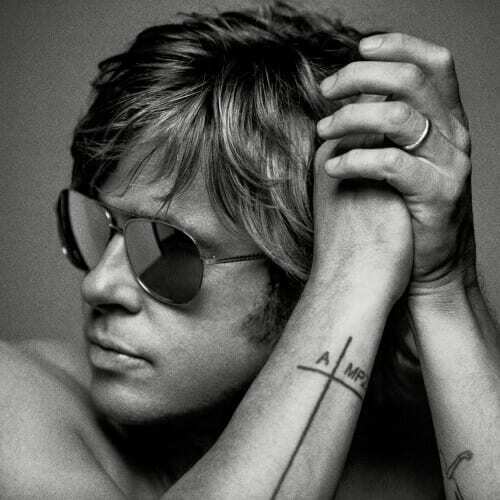 It’s easy to see why this chin-length hairstyle has become one of Pitt’s most recognizable looks in the past decade. The hairstyle looks amazing with stubble or a very short beard, provided it’s cleanly trimmed all around. You can also throw in some highlights for a summer look. 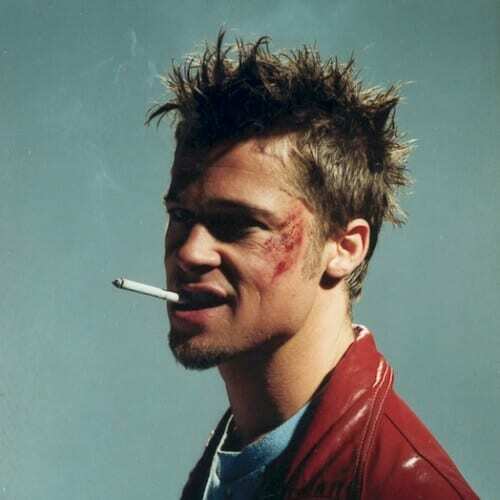 It’s undeniable that Fight Club will go down in history as one of the most iconic movies of our time. 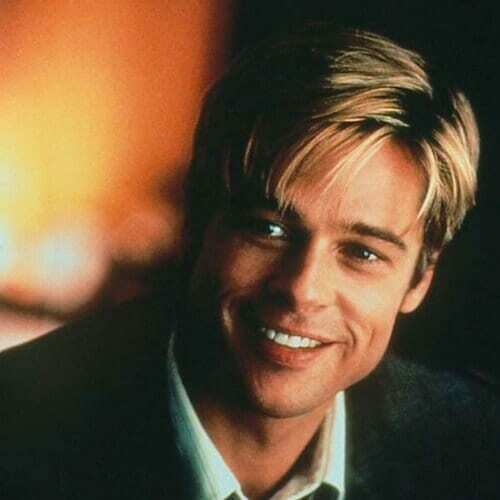 The character portrayed by Brad Pitt is one of the reasons why, including his unforgettable style. 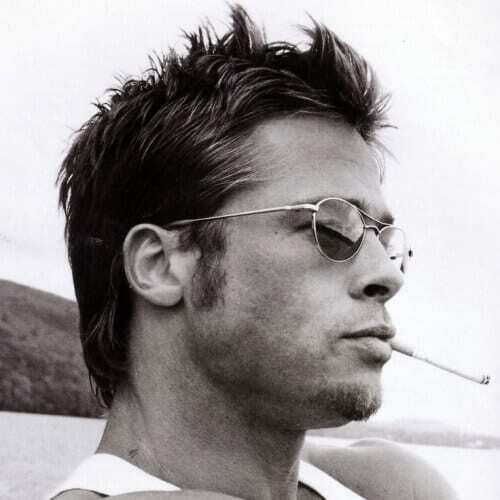 If you’re a rebel without a cause, consider recreating the spiky Tyler Durden hairstyle. If you want to add some edge to your appearance without going over the top, the faux hawk is always a smart way to do so. You don’t have to keep the front-to-back approach of the traditional mohawk. Just shave the sides and style the top towards the center. We have to admit that beards are a flattering choice for numerous men. Although it depends on the bearer’s personality, hair texture and facial features, we agree that a thick and full beard is a flattering option for many. However, we recommend keeping it well-groomed, regardless of length. Guys who frequently sport longer hair know how annoying the loose strands can get. If you’re tired of your hair getting in your face or you just want to play around with different ways of styling it, try tying it all in a low ponytail that rests at the back of your neck. 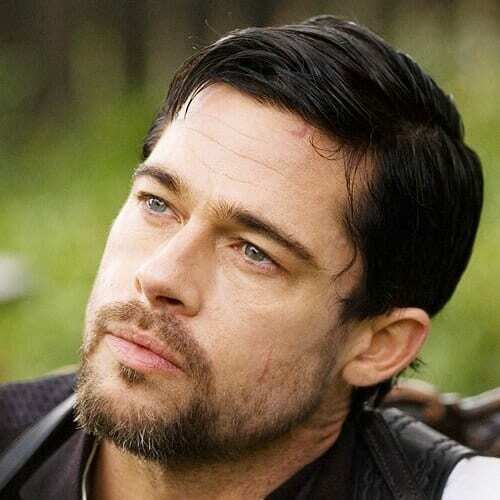 We’re used to seeing Brad with light-colored locks, but we will also catch him with darker ones for occasional roles. Beginning from this aspect, we want to point out that any man can switch up their natural blonde to jet black hair from time to time. As an alternative, you can experiment with some fresh highlights. Available in a broad range of colors, highlights can be used to update your look without dyeing your hair completely. Copper, caramel or light blonde are some of the most popular options. You already know by now that layers can impact almost any haircut in a positive way. Take this idea to the next level by making your layers choppy, uneven and messy. You will be able to style your hair with far more ease, in addition to other aesthetic benefits. Here’s another inspiring idea for our guys with longer hair. 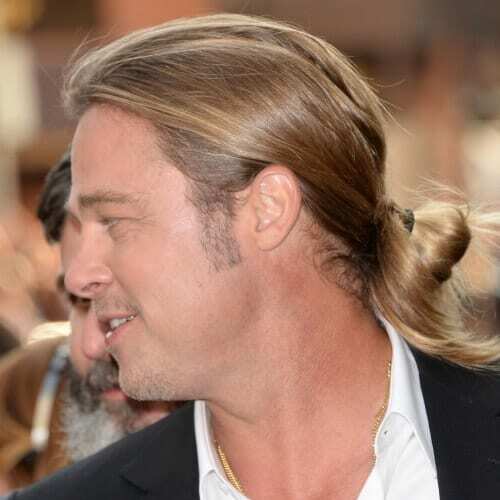 While you can always settle for the low ponytail style, you can also keep up with the trends by using a man bun. Even though it was the subject of light controversy in the past few years, we wholeheartedly agree that it’s practical and stylish. We’re familiar with the slicked back hairstyle, but what about a tempered alternative? If you don’t want your hair to come across as over-styled or greasy, you can tone down your appearance with a casual, swept-back hairstyle. 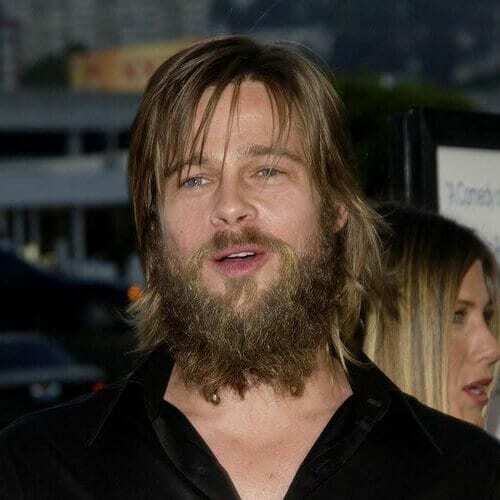 You can tell from a mile away that Brad Pitt is a man with class. From the way he holds himself, to the way he dresses, speaks and styles his hair, he always gives off the vibe of a polished man. Try styling your hair to the side and gently backwards for a similar look. 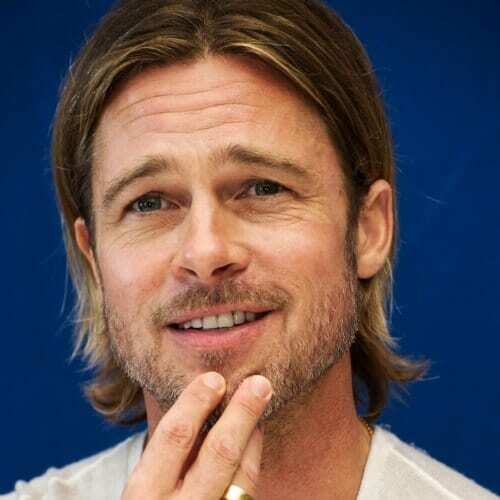 The class we were talking about extends even to Brad’s careless looks. Despite the fact that attitude plays the most significant role when coming off as nonchalant, it’s also about the way you style your hair. Try not to give it too much thought and let it fall naturally. 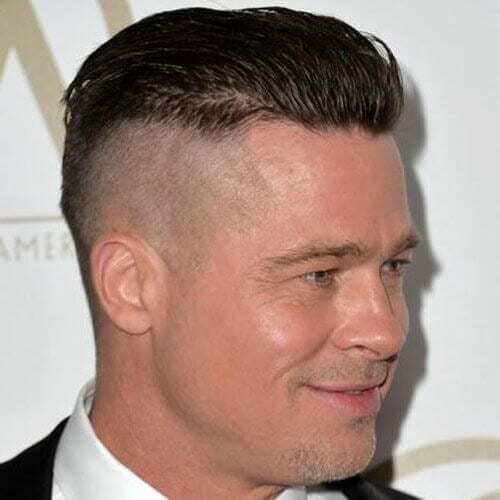 It may not be one of the haircuts that we typically associate Brad with, but we wanted to include it in our list as inspiration for men who prefer military cuts. The buzz cut has been around for ages, but it will never go out of style. Think about this option if you want a hairstyle that requires minimum maintenance. 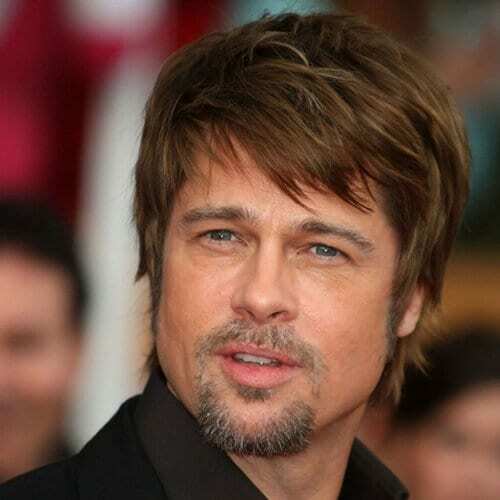 Here is yet another example for men who are considering bangs as part of their new hairstyle. As opposed to the first one we presented in which the bangs were just a detail, here the main focus is on the full, side fringe. 90s trends are back like never before, from apparel to hairstyles. This means that you can easily sport a bleached hairstyle these days and be fashionable. Nevertheless, please be aware of the potential harm that bleaching can bring to your hair. We wouldn’t go so far as to call this hairstyle a mullet, but we do agree that it stands out through a longer back than others. If you decide on this haircut, make sure that you get enough layers in so you won’t struggle with maintenance in the long run. If your hair has a naturally silky texture, you shouldn’t be afraid to show it off. Whether you have fine hair or it just tends to shine, think about keeping it a little bit longer all around. You can also get the look by putting more time and effort into long-term hair care. Men who sport anything longer than a military haircut will most likely have some hair product in their bathroom at all time. No matter if you have gel or wax, don’t avoid using it to style your hair. The key is in the quantity you use: not too much, not too little. Highlights don’t always have to be evenly distributed throughout your hair. In fact, we recommend that you take some time to talk to your stylist in order to find the best highlighting approach to complement your features. If you want to emphasize your eyes, consider streaks in the front. Can you see why you can never go wrong with a layered hairstyle? Proper layers will often accentuate the textured aspect of your hair, completing your overall appearance. It’s a simple yet effective detail for hairstyles of all lengths. You can’t get classier than an Ivy League haircut. It’s a suave hairstyle with various adaptations that will cater to almost any personality, hair texture or thickness. In addition to looking fine, an Ivy League cut is also significantly easy to maintain and style. Regardless if you’re a younger man or you’re just fond of the bad boy look, a surfer hairstyle may be just what you need. Indeed, it features longer hair that might be a pain to take care of, but you’ll truly be increasing your cool factor. While the angular fringe is usually associated with longer bangs, you can adapt this hairstyle for shorter hair too. This involves taking the front part of your hair, where your bangs would have fallen, and styling it sideways and upwards. 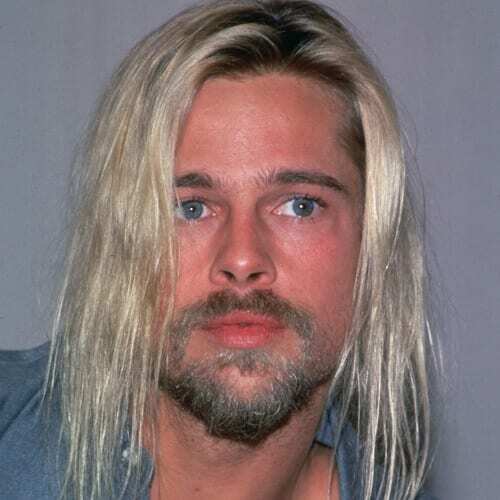 Let’s be honest; when Brad appears with longer and blonder hair, the resemblance to Nirvana’s former front man is uncanny. 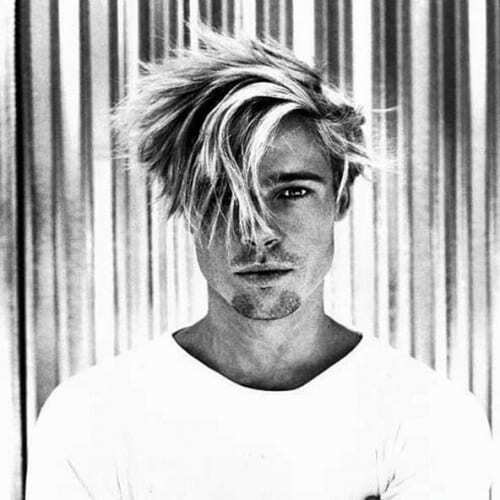 The late Cobain remains an icon for his genre, resulting that this type of hairstyle is exactly what grunge lovers need. Drawn to the idea of spiky hairstyles but don’t want to risk looking like a hedgehog? All jokes aside, there are modern ways you can wear spiky hair that won’t make you seem out of place. Just softly spike your hair to the side and you’re good to go. We could almost call the bangs in this hairstyle “accidental”, for the way they come across. 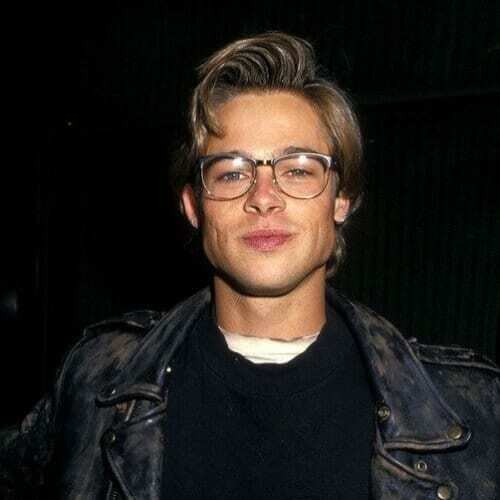 A look embraced by the young Leonardo DiCaprio and others in their generation, the random bangs hairstyle features longer hair and loose strands in the front. For an easy yet tasteful hairstyle, consider the crew cut. 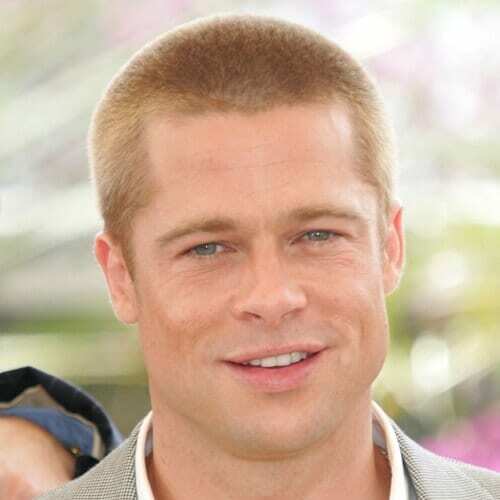 It’s the slightly longer alternative for the buzz cut, while still remaining in the short hairstyles category. We encourage men with busy schedules to keep this idea on their shortlist. Whether you’re a teenager or simply feel forever young, a boyish hairstyle is always an option to keep in mind. You shouldn’t put too much thought into this haircut, as being careless is one of the ways to master it. Keep your hair fairly short and tousle it. 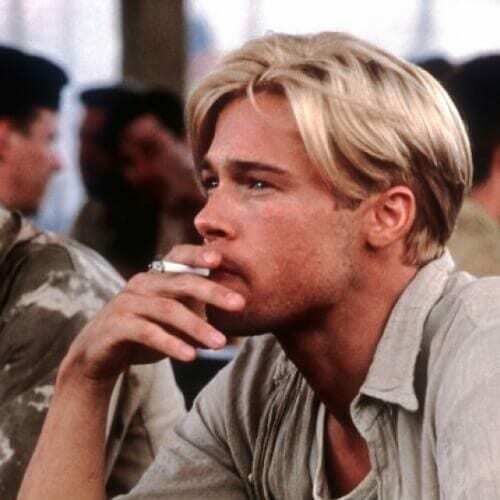 Little did Pitt know that one of the shots from his early 20s would accurately represent the modern-day hipster. Even though the glasses have a notable contribution to the look, the long and side-tossed hair is a reliable foundation. Here we can see one of the closest representations of dreadlocks without actually getting them. 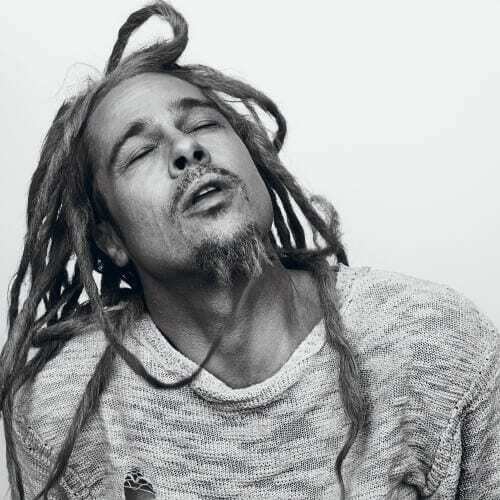 Even though Pitt wore this hairstyle for a specific photo shooting, we believe it can inspire men who are considering the idea of getting dreads. If you were born with wavy hair and you tend to have an unconventional style, allow it to grow longer. 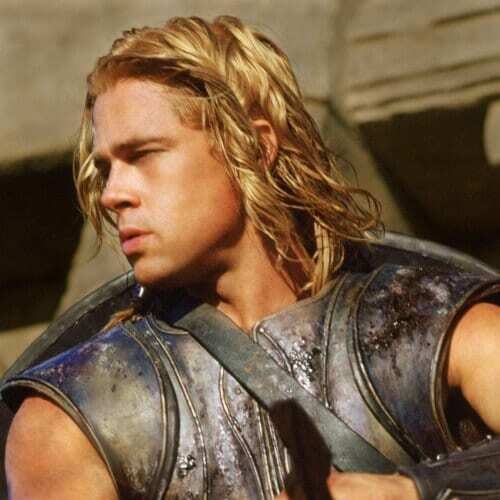 The shoulder-length hairstyle that Pitt wore in Troy serves as the perfect example of how awesome long and wavy strands can look. We often realize that having thick hair can be a curse just as much as it is a blessing. Guys who like shorter hair can get the haircut from this picture for a suitable everyday look. Although there’s nothing spectacular about it, the hairstyle won’t get in your way. 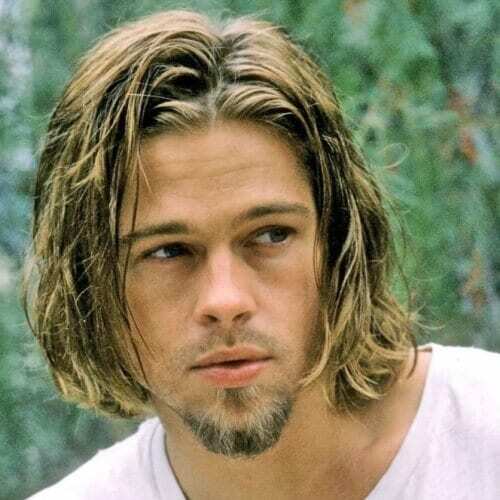 We’ll conclude by going back to Brad’s rebellious youth. It may not be alright for men who work in corporations or boys who face strict rules at school, but it’s a captivating hairstyle for the eternally young and restless. Don’t limit yourself when it comes to self-expression. 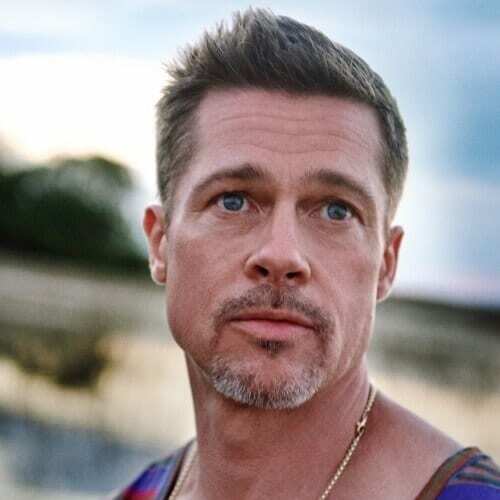 In conclusion, it’s a smart move for any man to study Brad Pitt hairstyles prior to changing their look. The beloved actor has experimented with so many haircuts in his career that we’re sure you will find one to complement your style. 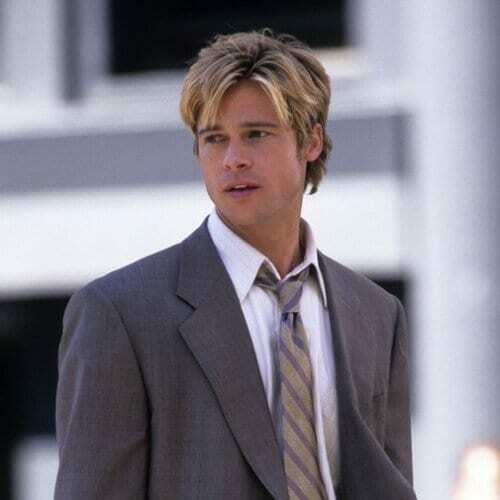 Would you go for a short or long haircut inspired by Brad Pitt? Let’s talk about your favorites below.